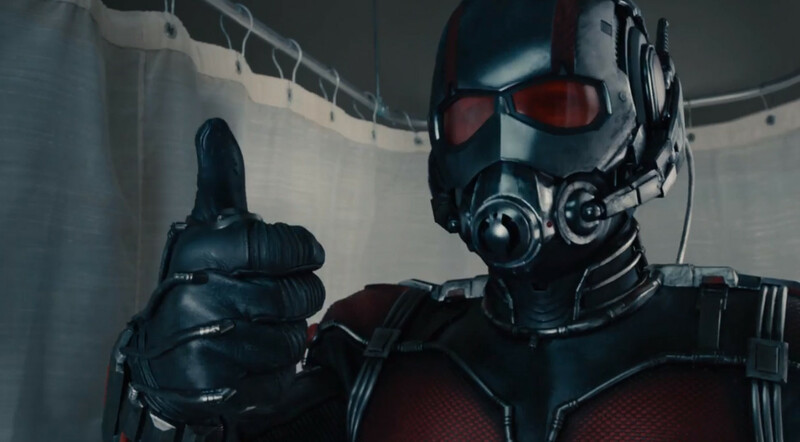 Ant-Man (2015) – Movie Review – Another Movie Blog! Ant-Man as a movie idea was sitting around the margins of Marvel Studios since 2006, before even Iron Man’s release, and was kept in circulation after multiple push backs mainly through it being headed by cult cinema icon Edgar Wright. When it finally was put into production around nine years later, it looked set to be the palette cleanser for Phase two after the bombast and high universal stakes of Age of Ultron, with a cast headed by Paul Rudd and looking set to produce many laughs. But just as production was to start, Edgar Wright left the project due to that dreaded vague spectre “creative differences”, the collapsed structure was given to comedy director Peyton Reed, and the behind the scenes became an ideological battleground in movie circles regarding studio and director control. So let’s get this out of the way: yes, it’s a massive disappointment that Edgar Wright, maybe the greatest genre filmmaker of the 21st century, had to leave the movie he had been working and spearheading for nearly a decade. It’s the biggest example of the studio mandating of Marvel getting in the way of talent, and although it would be incredibly unfair to suggest Peyton Reed and accompanying scriptwriter Adam McKay (both men with good pedigrees) did not bring their own ideas and flourishes to the table, there are couple of examples of Edgar Wright signatures like Luis’ (Michael Pena) speaking montages and fight scenes set in model areas (Hot Fuzz, anyone?) that will always make me think of the movie that could have been. This could have been a PR and studio disaster for Marvel Studios if the finished product didn’t turn out well. But, fortunately for everyone involved, it did. After the increasing inflation of these movies, its nice that Ant-Man goes back to something, figuratively and literally, small. The stakes are personal, particularly in Scott Lang (Paul Rudd) and his relationship with his daughter and ex-wife – though 2015 was not kind to Judy Greer in terms of roles with substance – and the tangential connection between Hank Pym and his daughter Hope Van Dyne, and the drama here Paul Rudd sells maybe more well than he sells the comedy. Incidentally, it is enjoyable how the movie goes out of its way to present the stepfather of Scott’s daughter as basically a decent man, wanting to do right by his new family. It is systematic of the thing Marvel nearly always remembers to get right; if you give us character stakes, we will like and want to see more. One way these characters are emphasised is through the nature of its own genre, a heist movie, with all the planning, trail and error and character specialities that have been the model of the genre since Rififi. This is allows incidental characters to shine, particularly Michael Pena who essentially steals the show as Scott’s pal Luis, with his monologues and good natured mannerisms. It’s also great that, by the nature of the small scale of the story, that this is the rare Marvel movie which gets better at its climax. And this rather bizarre climax, akin to The Incredible Shrinking Man, also hints at Strange things to come. Unfortunately the quality of its finale is more a circumstance of scenario and Reed’s comedy touches (The Cure!) rather than, again, the villain. Corey Stoll for the most part can’t make a man called The Yellow Jacket all that menacing. The incredibly quick change over of his character makes me think that his character was supposed to be a more comedic villain in previous scripts, but at some point that got lost in translation. Another short changed character is Evangeline Lilly as Hope, whose anger of Scott Lang as the subject of her dad’s plans (Michael Douglas looks like he is having fun as Pym, incidentally) instead of herself is a little too warranted for it to play off as the big “we can’t produce female superheroes yet” joke that the end credits scene and upcoming sequel show it is here. This means she ends up as another badass at everything who only exists to train the good guy and then kiss him, endemic of a problem with a lot of female characters that I hope the sequel will fix.